Creating a blueprint to improve a popular Chicago tourism service. Chicago Greeter offers visitors a chance to tour one of the city’s 77 neighborhoods with a local expert. 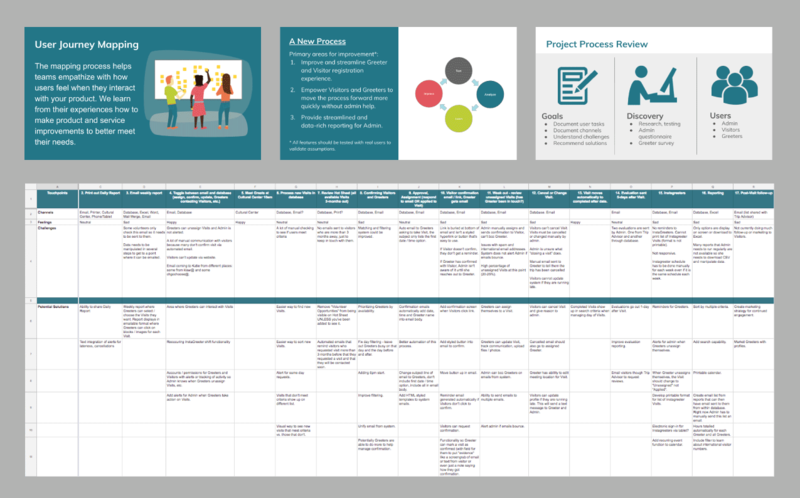 Here’s how Mightybytes used customer journey mapping workshops to create a roadmap for improving the service. In 2010, Mightybytes built a custom software solution that matches potential visitors with local tour guides and helps admins manage tour logistics. After seven years of use and several updates, the folks at Choose Chicago, the organization that runs the Chicago Greeter service, knew it needed improvements, but weren’t sure where to start. Mightybytes facilitated two customer journey mapping workshops with key Chicago Greeter stakeholders. These workshops helped attendees identify problem areas with the service and devise a plan for improvement. Administrators: Choose Chicago team members tasked with managing the system and facilitating connections between neighborhood experts and those wanting to learn about specific neighborhoods. Greeters: Chicago neighborhood experts who give tours. Visitors: People requesting tours of city neighborhoods. We captured important channels, touchpoints, and feelings via the whiteboard for each Chicago Greeter stakeholder type. The first journey mapping workshop focused specifically on the admin experience and potential ways to improve their experience. Because Chicago Greeter admins interact with the other stakeholders both through the software platform that Mightybytes built and via other channels such as email, social media, phone, and text, we wanted to identify opportunities to improve the quality of touchpoint interactions across all channels, not just within the system we built. Attendees for the second customer journey mapping workshop included greeters and a former visitor turned greeter, who provided insights from both perspectives. Were visitors able to easily register for a tour via the website or did they abandon the registration process? Did they complain on Twitter because their greeter never showed? Did admins have to resort to more traditional communications channels because of missing features within the software system? Were greeters and visitors communicating independently of the Greeter admin system? If so, what were they saying? Once these touchpoints were identified, we reviewed and took specific notes about how stakeholders felt during each individual interaction. Were they frustrated? Excited? Angry? Neutral? 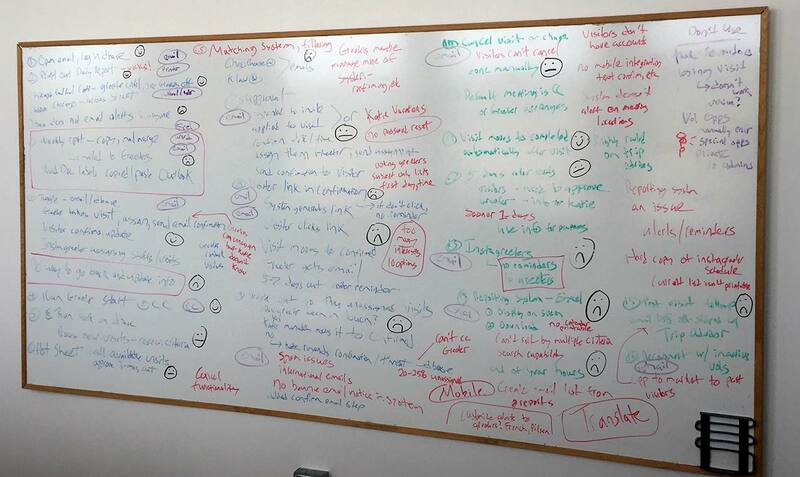 Once all the important stakeholder information was captured on our whiteboard, we translated and analyzed it for a detailed report. By identifying how stakeholders felt during individual interactions a picture began to emerge of where improvements were needed to make the Chicago Greeter experience as delightful as possible for everyone. Using these emotions as guideposts, we then brainstormed potential ways to fix things that were broken, add enhancements to the digital product, and provide more rewarding stakeholder interactions to improve the Chicago Greeter service overall. After the two workshops, Mightybytes delivered a final report that consisted of insights, analysis, and recommendations for improving the Chicago Greeter experience over time based on what we learned from the experience. Mightybytes delivered a presentation as well as a detailed spreadsheet outlining all insights from each journey mapping workshop. In this report we outlined improvements that arose from our workshops and made recommendations for prioritizing and implementing those improvements into the software platform. With this information, the Chicago Greeter team has a clear roadmap for improving the service—both online and offline—over time. For more information, check out our customer journey and experience mapping services or read our post, What is a Customer Journey Map? [Free Template Download].